This book is a wonderful resource on information regarding the different ethnic groups from Laos. 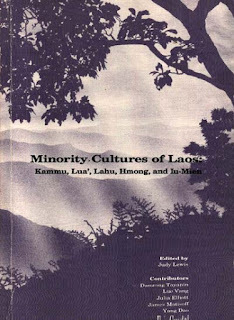 However it does only focus on Kammu, Lua, Hmong and Mien. It includes a lot details on their customs, lifetsyle, clothing, as well as, some pictures and images. The variety of ethnic groups in Laos adds to the colorful variety of customs, clothing, and food that exist there. It's nice to see this American published book provide focus on otherwise lesser known cultures. It was created and published in California in 1992. And it's still available both for sale and for free download from the Refugee Educators Network website at the link above.